Results That Make You Look Good! Our online auction platform is designed to help government agencies and schools more efficiently sell surplus and forfeiture items to the public for more money and without the hassle. All at no cost. Our clean, organized website design works great on any device inspiring trust and confidence in bidders and sellers alike. Users who have switched to Municibid tell us, “Wow, this is so much easier!” You’ll notice how fast and simple it is to list items. And bidders won’t believe how easy it is to find and bid on your items. Our cutting edge technology provides a high performing website that is engaging and easy-to-use no matter which device you and your bidders prefer. Our Marketing program brings surprising results for your items by exposing them to a huge audience of relevant buyers on a local, regional and national level. You'll clearly see the pride we take in delivering a highly personalized customer service experience, whether it’s through our support page, Municibid Messenger, email or phone. You'll have quick access to a host of compliant, customizable and downloadable reports using Municibid Metrics, our powerful reporting tool. Did you know that potential bidders use their mobile devices to search for and bid on your items more than they use their desktop browsers? Municibid has been designed to look and work great on any device with our fully responsive, mobile friendly site design. We encourage you to compare Municibid on your phone to other providers to see for yourself! As you use and navigate Municibid, it’ll feel clean and organized. This fresh, modern look and feel inspires confidence in bidders who may be intimidated by or distrustful of outdated websites and processes. Your peers, who have already switched to Municibid from other online auction providers, consistently say, “Wow, this is so much easier!” and we know you will too! You’ll be able to list items faster and quickly access useful reports. Bidders will be able to find and bid on your items effortlessly. We put your items in front of the right audience. For free. No one does more than the Municibid Marketing Machine to ensure your items are properly advertised and marketed. Your items are exposed to the right buyers via highly effective, targeted campaigns on a local, regional and national level, all at no cost to you. You will notice right away the pride we take in delivering a highly personalized customer service and support experience. Whether it’s through our support portal, Municibid Messenger, email or phone, you can rely on Municibid for a truly pleasant, personalized experience. Municibid Help - A great, quick resource for bidders and sellers to quickly get answers to their questions. Municibid help also offers tutorials along with tips and tricks. 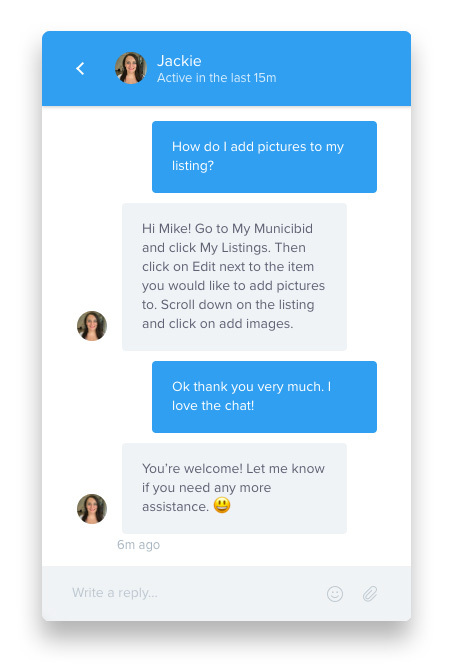 Municibid Messenger - An easy and powerful chat tool that you can use to communicate with Municibid. Simply click on the orange circle with the chat icon that appears on the bottom right side of every Municibid page to start a conversation with a Municibid expert. You can even attach files and view all previous chats. And that’s just the beginning of what Municibid Messenger can do—see more on the Marketing page. Support Phone and Email - support@municibid.com | 800-531-6075. Monitored 24/7/365. Live help available between 8:00AM-8:00PM ET Monday-Friday. 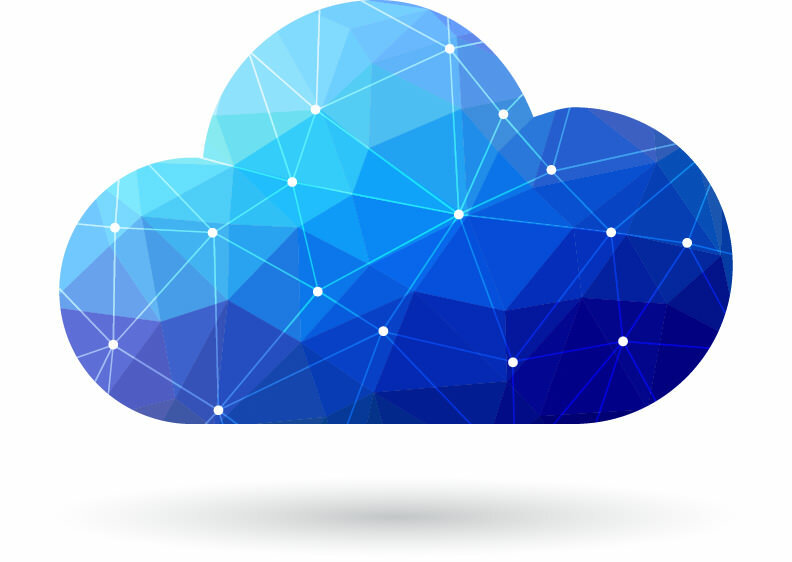 Municibid's cutting edge technology features fully redundant servers with failover and load balancing technology to maintain optimal performance and 99.999% uptime. All data, records, and reports are stored forever and are backed up several times daily. All of this is backed by the world’s leading datacenter. You can access Municibid via any modern web browser such as Internet Explorer, Google Chrome, Firefox, Safari. Our site is designed to be fully responsive (adjusts to various screen sizes) on mobile devices such as iOS (iPhone/iPad), Android, and more. While several online auction sites haven’t been updated in years, we consistently release new updates and features to provide you with the best possible user experience. New releases are thoroughly and rigorously tested by our team of highly experienced developers and engineers before they’re made available for you to use. You rely on accurate, detailed reports that you can easily access anytime. We understand how important this is for you, and that’s why we provide the best reports and reporting tools in the industry. Municibid Metrics is a powerful reporting tool. It gives you quick and easy access to the reports and data you need to gain valuable insight into your auction and sales activity. Your Municibid Metrics dashboard will contain an array of reports on any data you want regarding your Municibid auction activity. Municibid Metrics is fully customizable to meet your exact requirements. Municibid Metrics’ reports can all be easily and quickly downloaded to meet a variety of formats such as CSV and Excel and can be printed or saved as PDF, PNG, and even Vector SVG format (for larger format printing). 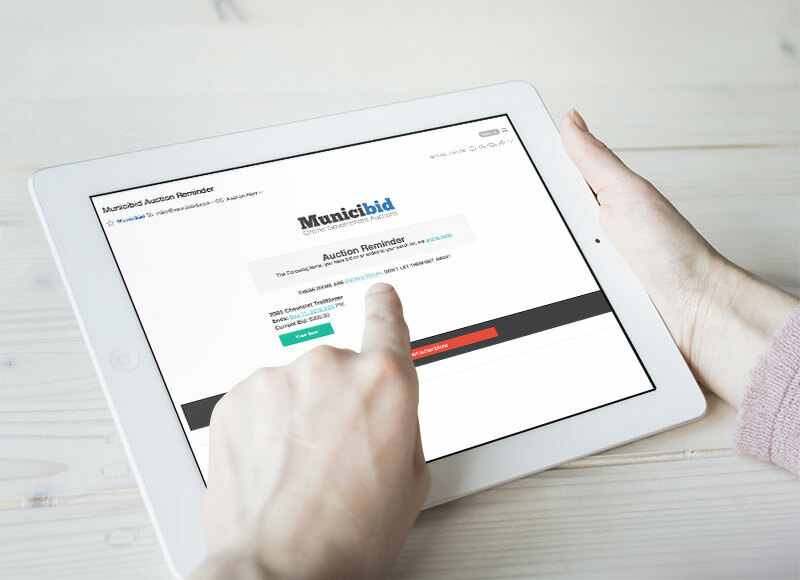 At the close of every successful auction, Municibid will send you a detailed PDF Auction Report, containing valuable data including contact information for all bidders and more. You’ll also be able to download these reports anytime you want, right from your account. Using Municibid’s Customizable Sold Asset report, your agency can easily run reports on closed auctions for any date range specified. The standard sold asset report includes Listing #, Custom ID, VIN, Title, End Date, Winning Bid amount, Winning Bidder name, phone and email, Number of Bids. Features Designed to Give You Better Results! We are invested in your success and do everything we can to help your auctions be successful. One way we do that is to promote bidding activity on your items with various website features. Our website features give you better results! 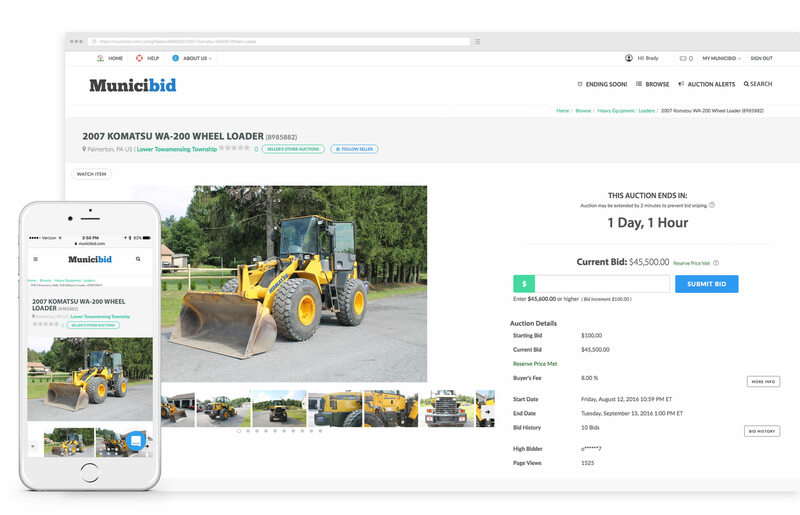 With many online auction providers, users must refresh their page to see updated time remaining, highest bid, number of bids, and current high bidder. Municibid Real-Time Updates removes this hassle. We make it update live! Thanks to Municibid Real-Time Updates, your item pages update live, in real-time and always provide the most current information. Bidders are also notified if they have been outbid in real-time—this entices them to place another bid. This feature gets really fun and exciting when several of your items are ending soon. You’ll get a thrill out of watching your items receive bids in real-time, live on your screen. Municibid Auction Alerts ensure that your bidders will never miss another deal! Our Auction Alerts are emailed daily and notify bidders when new items are posted from a seller they follow or correspond with a keyword they’ve subscribed to. We give bidders the option of easily adding items that interest them to their Municibid watch list. Each morning bidders who have bid on an item that closes that day will receive a friendly email reminding them that the auction is ending shortly. Auction Reminders are proven to increase bidding on the final day of the auction dramatically. We take several measures to eliminate fraudulent activity such as bid rigging, shill bidding and bid sniping. All bidders must provide a verified US and Canadian address and credit card before bidding. Additionally, Municibid stores IP addresses each time the user signs in. Bid-sniping protection is built into every Municibid auction. This protection prevents people or software from placing a bid at the very last second, locking out other bidders. On Municibid, if a bid is received in the final two minutes, the auction will extend an additional two minutes from that point until no further bids are received. 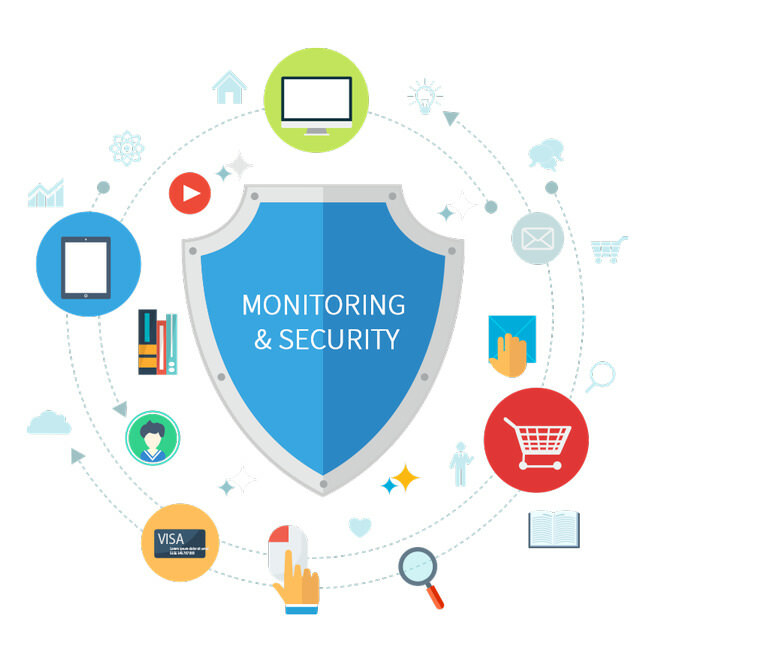 Municibid is fully secured via industry standard SSL Certification, is PCI compliant and is monitored 24/7/365. 2,000 agencies (and counting! ), just like yours, trust Municibid to sell their surplus successfully. From large cities to small towns, counties, school districts, universities, authorities, and local fire departments, more and more agencies have discovered the best way to sell their surplus: Municibid. “The City Parish is very pleased with the results of the online auction process and the partnership we have with Municibid. This was a new process for us and these results confirm we made the best choice in choosing Municibid as our online expert to guide us during the transition implementing the online auction method." 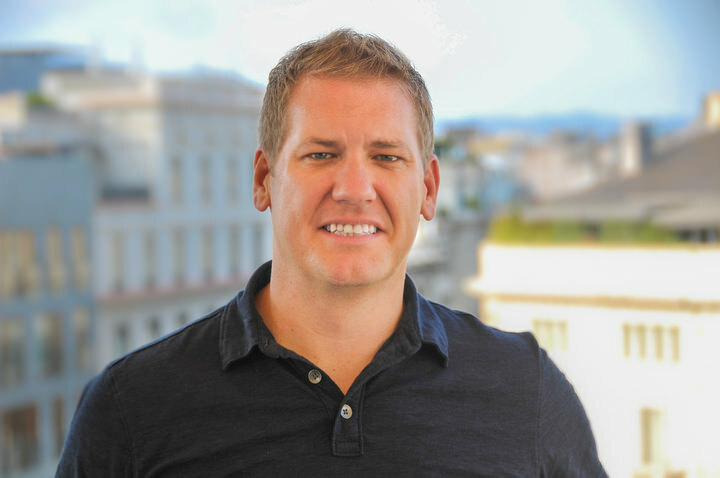 Why are agencies switching to Municibid? See why more and more agencies are successfully switching to Municibid from other surplus disposal methods. There was a time when the easiest legal option for selling surplus was to take sealed or local bids. You put a legal notice in the paper, hoped people would see it, and waited for people to come in and submit a sealed bid. 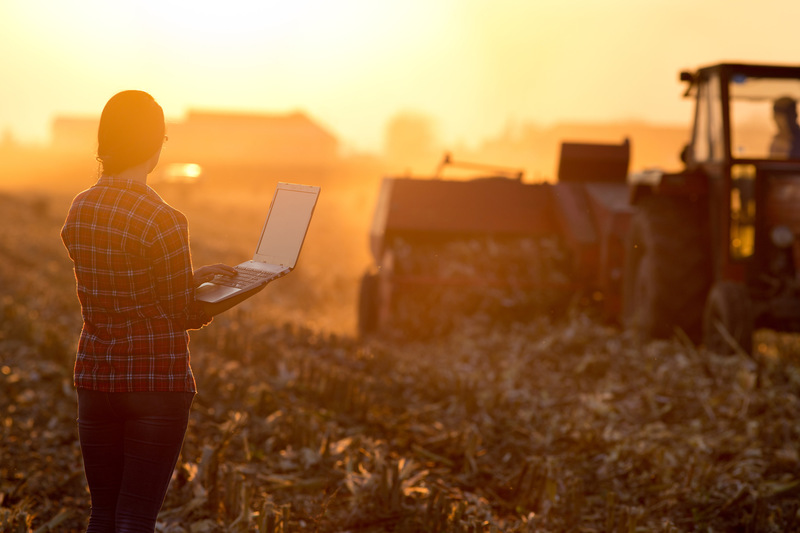 With advances in technology, this approach to selling surplus is outdated and does not maximize the results of your sales. Municibid reaches a far larger audience and generates higher sale prices for your items. Municibid is more convenient. Interested bidders can bid when they want, no matter where they are. And since Municibid is a competitive platform, bidders compete to win an item instead of just submitting one bid. This approach leads to significantly higher sale prices. Municibid does all of your reporting for you and enables you to view comprehensive auction activity information and data (see reporting). 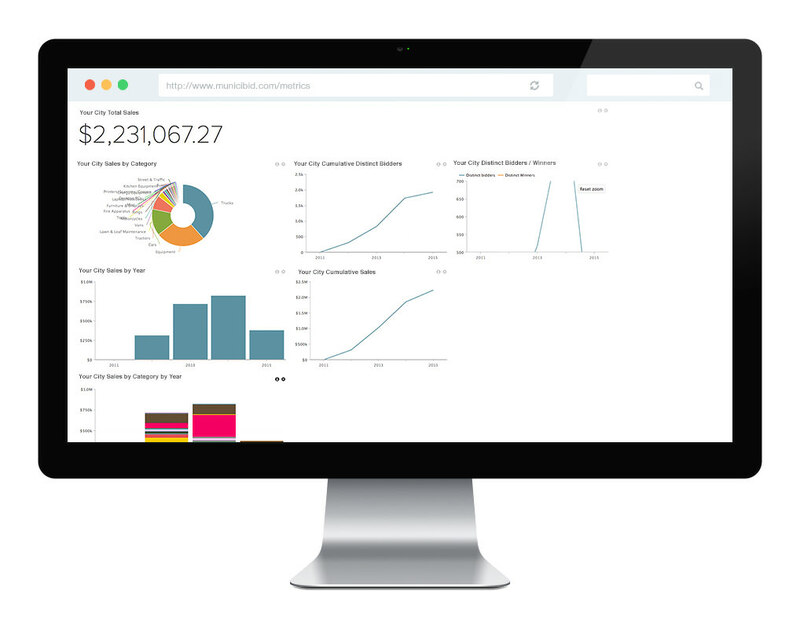 You’ll never need to create bid tabulations or reports manually again! You still have the ability to reject bids for any reason and, of course, there is no cost to use Municibid. Why are agencies switching to Municibid? It starts and ends with providing better results for each of your auction items. Municibid is designed to be surprisingly easy-to-use. Listing items for auction is quick, simple and hassle-free. Bidders can very easily and conveniently find and bid on your items. Municibid’s fully responsive website looks and works great across any mobile device (iPhone, iPad, Android devices and more), not just your desktop computer or laptop. This is important because over 60% of bidders are bidding from mobile devices. We highly encourage you to visit and use Municibid on your mobile device and compare us to other online auction providers. 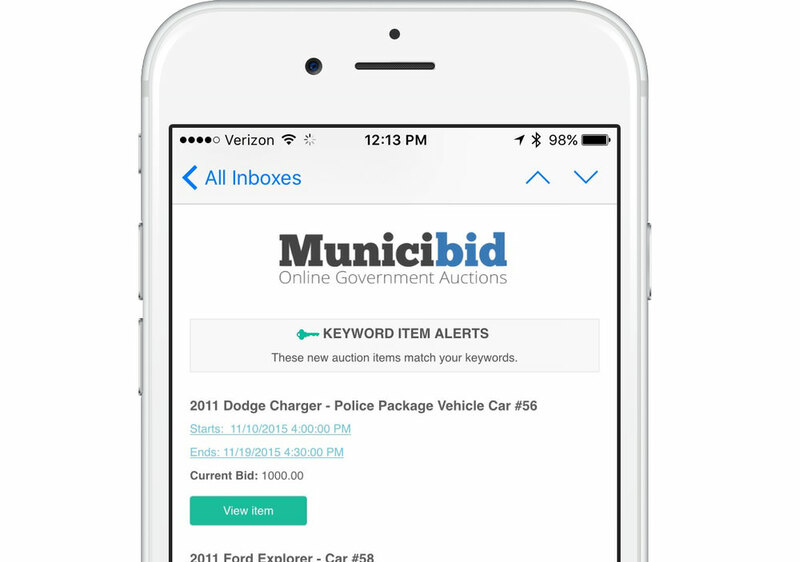 Municibid doesn’t just provide a platform for you to auction your surplus items. We take a proactive, targeted approach to get your items noticed. We use a variety of effective channels to market every auction item, both locally and nationally. 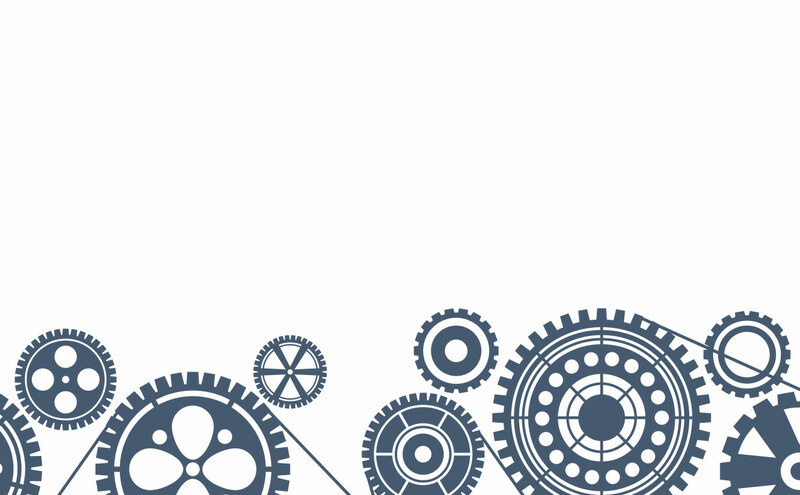 See our comprehensive marketing program. We take great pride in delivering the absolute best customer service. We’ve designed our website to be intuitive and easy to use to reduce the need for customer service. But when support is needed, we are here 24/7/365 via our support portal, our Municibid Messenger online chat system, and by email or phone. You need more than just a simple report on auction activity. With Municibid Metrics, our powerful reporting tool, you have quick and easy access to a number of truly compliant reports that provide you with insight into all aspects of your auction activity. See Municibid Metrics. Unlike other providers with confusing sales commissions, buyer’s fees, listing fees, and other charges, Municibid keeps things simple. •	You always keep 100% of the proceeds from your auction items. •	We never send you any invoices. You can easily transition from your current provider to Municibid. We don’t require contracts or ask you to be exclusive to us, and we are available on an “as needed” basis. If you are currently using another online auction provider, contact us to find out how we compare with your specific provider. See our pricing model for more details. Live auctions can be fun and exciting and are generally a better option than accepting sealed bids. So why choose Municibid over a live auction? Typically, you’d have a live auction once per year, which requires you to stockpile items for the big day. Unfortunately, items lose value every day they sit around, especially when it comes to vehicles and equipment where parts go bad (e.g., batteries die, belts dry out, parts rust, tires flatten). With Municibid, you can list items as soon as they are declared surplus. Your big auction day is just days away, and rain or snow is in the forecast. Whether or not the weather actually ends up being bad on the day of your auction, you can expect fewer potential bidders to show up, especially if it’s an outdoor auction. With Municibid, weather won’t have a negative effect on the success of your auctions. Your live auction is one particular day, and your items come up for a just few minutes at a time. People who can’t make the auction on that day are left out. People who don't want to travel to your auction won’t be there either. Municibid users live all over the country and are not bound to a local geographical area. Also, with Municibid, people can place bids over the course of many days and can even let Municibid bid for them (it stops when bidding reaches their maximum bid). Some live auctions are also simulcast over the Internet for online bidding. That is a step in the right direction, for sure. However, your item will still only be available for bidding for a very a short time (a few minutes at most). Plus, during this frantic few minutes, online bidders may feel confused and at a disadvantage against bidders who are present at the auction site. Do you know how your auctioneer plans to tell potential bidders about your live auctions? Municibid uses a proactive and comprehensive targeted marketing program that gets your items in front of an enormous pool of interested bidders. Does your live auctioneer provide you with a comprehensive report that includes all bidders’ contact information, amount of bid, and time/date of bid (regardless of if they win or not)? For open records and transparency requirements it is essential that you have a complete record of all bidder activity. When you hold a live auction, can you quickly pull up a report or dashboard showing total sales, sales per category, sales by bidder, most active bidders, bidders by state, over any data range you want? With Municibid, you can. No commission. No transportation costs. What commission does your auctioneer charge to you and the buyer? What about transportation costs? With Municibid, you are never charged any fees or sales commissions. You also don’t need to worry about coordinating or paying for item transportation to the live auction site. And after the auction, winning bidders go to you to pick up their items (at their cost). Our statistics show that we consistently beat trade prices. In fact, many equipment dealers refer their government customers to us because they know items frequently sell on Municibid for more than they would offer. You’ve got nothing to lose. You can reject any bid, even if it meets the reserve. Municibid offers an easy and risk-free way to try to beat your trade quote. If you trade in vehicles/equipment, we suggest asking the vendor to provide a quote and setting that as your reserve on Municibid. Simply Put, IT'S FREE TO SELL! You can use Municibid as little or as much as you want. You are never committed to us through a contract unless you require it. You'll never see a hidden fee from us. Everything is included in your already free account. We have found our buyer’s fee to be highly competitive and lower than what similar providers charge. This fee allows us to execute an extremely effective marketing campaign for your items. Some providers may seem alluring because of their super low commissions and buyer’s fees, but they don’t spend money on marketing your items. The net result is lower sale prices for your items. Due to the highly competitive nature of Municibid auctions, the 8% fee has little to no effect on the sale price. Bidders are not bidding 8% less; rather, they are more concerned with increasing their bid in order to outbid competing bidders. This fee is a completely separate transaction from the item transaction and is paid directly to Municibid by the winning bidder. You will never collect this fee from bidders or ever have a need to send money to Municibid. You can feel good knowing we understand first-hand what it’s like working in government and being constantly asked to do more with less. 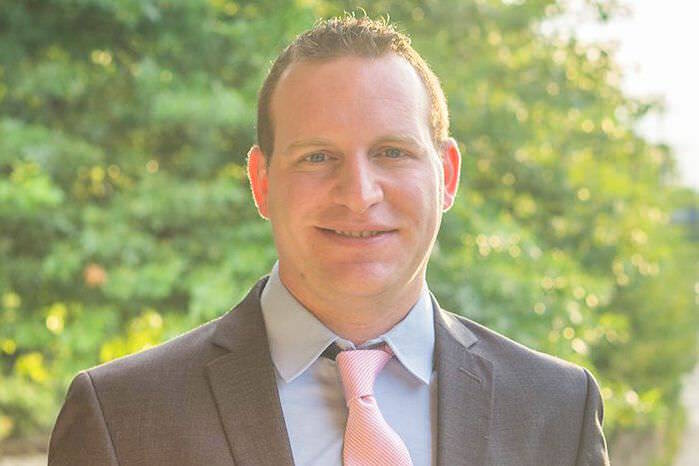 Our leadership team is made up of a former borough council vice president and a former parks and recreation director who understand the interworking of local government and the requirements you might have. Who can sell on Municibid? To sell items on Municibid you must be a local, county, or state government agency. We also allow schools, colleges, fire/police departments and any other agencies related to public service. Authorities (utilities, transportation, etc) can also sell. If you are not sure if you can sell, please contact us. Good news! It's completely FREE for you to sell your items on Municibid. We do not charge you any fees to sell your items on Municibid. You keep 100% of the final bid. We charge the winning bidder an 8% buyers fee. This fee is charged on top of their winning bid so you always keep the full amount of the winning bid. We handle this transaction so you never have to worry about it. Will the buyer’s fee affect bid prices? Typically not. Due to the highly competitive nature of Municibid online auctions, the mindset of bidders is “what’s another $25 or $100” and not “wait, let me subtract 8%.” In other words, bidders are not bidding 8% less, rather they are willing to bid just a little more to win the auction. Can we set a minimum or reserve price? Yes. Municibid allows you to set a reserve price, but is only recommended in certain cases since you always have the right to reject bids and sometimes have a reserve set deters bidders. Absolutely! Municibid makes it clear to our bidders that the selling agency has the right to reject bids for any reason. There is no cost to your or the bidder if a bid is rejected. Do we need to run a legal notice or advertisement? Each agency and state has different rules regarding legal advertisements. Please contact us and we will help you determine your requirements. We will also be able to provide you with a sample advertisement, if required. Speak with a Municibid Expert! Join Thousands of Successful Sellers!